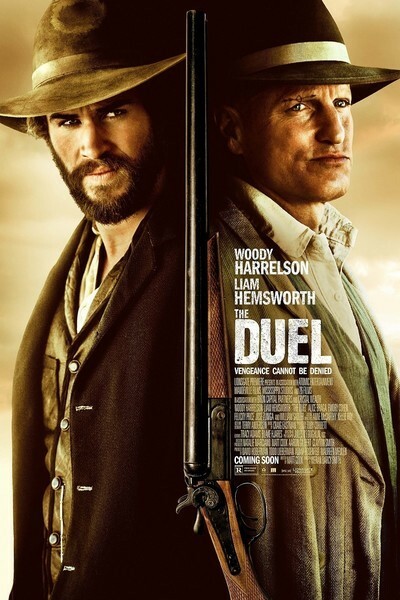 “The Duel” opens quite promisingly. Two men have chosen to fight to the death using the exact same method shown in Michael Jackson’s “Beat It” video. In one hand, each man holds a knife; their other hands are tied together at the wrist. The film calls it a “Helena Duel," named after the Texas town where this opening sequence takes place. Prior to the violent festivities, a scroll tells us it’s 1866, and Civil War veterans are battling with Mexico over Texan land. These details are irrelevant during the Helena Duel, however. This is a personal matter between two American citizens, Abraham Brand (Woody Harrelson) and Jesse Kingston (Jimmy Lee Jr). As the men dance, evade and slice, director Kieran Darcy-Smith presents the carnage from different vantage points. The quick edits between obstructed and unobstructed views couples with the gruesome sound effects of knife meeting flesh. The result is a brutal, swift and memorable action sequence. Witnessing the carnage is the younger incarnation of the film’s main character, David Kingston. His presence at his father’s demise sets up a “Kill Bill: Volume 1”-style promise of later retribution and revenge. Fast-forward 16 years, and the adult David (Liam Hemsworth) is now a Texas Ranger assigned to investigate Abraham for a series of murders in a small town near the Rio Grande, where the bodies are dumped. The victims are all Mexican, including the nephew of General Calderon (José Zúñiga), a prominent Mexican figure who, if not satisfied with the Rangers’ ability to get answers, will bring his own militia across the Texas border. At this point, “The Duel” appears to be your standard-issue revenge Western, which is enough to satisfy. However, Matt Cook’s screenplay has a few extra story aces hidden up its sleeve. Unfortunately, they do little to better this film’s poker hand, because a fella holding five aces is going to look mighty suspicious in a one-deck poker game. Revenge should be enough to drive the story, but “The Duel” also has snake-infused religious mysticism, treacherous women and more than one callback to “The Most Dangerous Game." As the film drags on, not even another Helena Duel can hide that the film is biding its time with unnecessary dramatic filler. Jesse's death may have been the best thing to happen to his son, for it meant his son might be raised to be decent. David does seem like a nice, if not exactly lovable guy, and Hemsworth ably walks that fine line. There’s a hint of nobility in his decision to seek out Abraham solely to bring him to justice. Yet his devotion to his law enforcement job is several steps higher than his love for Marisol (Alice Braga), the wife betrothed to him by her father as a reward for nursing him back to health. Marisol threatens to abscond if she is left alone while David investigates Abraham, so he has her tag along. It is an unwise decision. Approaching the town, Abraham’s son, the aptly named Isaac (Emory Cohen) meets the Kingstons and ominously eyes them in the “we don’t take too kindly to strangers” way seen in far too many Westerns. David lies to avoid suspicion, and soon he is in the company of his quarry. Abraham has some kind of powerful hold over the town, in terms of law enforcement and spirituality. The townsfolk call him “The Preacher” and he presides over Sunday services where snakes replace those popsicle stick cardboard fans found at normal revivals. Marisol falls quickly for his charms—too quickly, as the film fails to clarify just who the hell Abraham is. Is he a charlatan, or does he have the powers to make women sick as dogs before they inexplicably fall for him? Regardless, David's suspicions grow when Abraham randomly makes him the town's sheriff. Could this be a ploy to get David away from the house so Abraham can pitch literally vomit-inducing woo at his wife? There’s a lot more nonsense here, all of which starts out intriguingly before overstaying its welcome. A friendly, constantly abused prostitute named Naomi (Felicity Price) offers to help David figure out where all those river bodies are coming from, if, that is, he’ll help her escape from this hellhole. You know what happens to her. As for the bodies, you know how they’re getting there, too. I don’t know if “The Duel” is some kind of symbolic immigration statement, but every Mexican in the film is either a traitor or a victim. Save one, that is, which is par for the minority character course. Harrelson is supposed to be the villain here, but he’s more wishy-washy and weird than scary. This is a role for either an unhinged Nicolas Cage or an overzealous Christopher Walken, actors who would transcend the dullness on the page with their trademark quirks. The script has little respect and regard for Abraham’s evil, despite him dealing in all manner of murderous activities. In one hilarious scene late in the film, Abraham is treated like Wile E. Coyote while David portrays the Acme Company. By that moment, all the promise and goodwill of “The Duel”’s intelligent first half-hour has gone. It’s floating down the river with all those scalped dead bodies while the viewer impatiently waits for an unsatisfying deus ex machina of an ending.